Mix 1 serving (70 g = 2 scant measuring spoons = 5 heaped tablespoons) with 500 ml water. Drink 1 serving directly after workout a 1 serving between two meals. Mix 1 serving (70 g = 2 scant measuring spoons = 5 heaped tablespoons) with 500 ml water. Drink 1 serving between meals. This product is recommended especially to people with ectomorph body type. 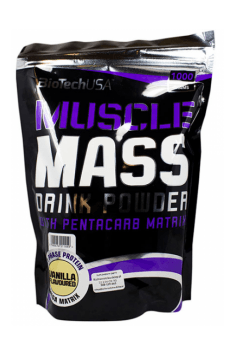 Using this blend together with exercises and diet will facilitate the muscle mass gain. In addition, creatine monohydrate will allow more repetitions, which will increase efficiency and training performance. To prevent clumping it is recommended to use shaker. Extreme Fat Burner. Contains coca leaves extract, yohimbine, DMHA and other strong substances.